Someday I am going to have to go through my blogs again and re-categorize them. In an attempt to be more orderly, I deleted all categories and left only “General”. Halfway through the process – well, when I was done deleting, but before redoing – I lost interest. No worries; it is on the to-do list for someday. Someone let me know when “someday” gets here as I have a BUNCH of stuff just waiting for then to get started. This week was a roller coaster of emotions, but more on the scale of a shorter-than-48-inches roller coaster as opposed to the Rip Ride Rocket at Universal Studios in Orlando. Those are the easiest comparisons I can show to really illustrate how I felt. I am currently writing this blog from my sister’s house, so I will begin my update there. It is backwards, I know, and I am well aware that there is a handful of people wondering about my status with the Army. I will get to it, I promise. 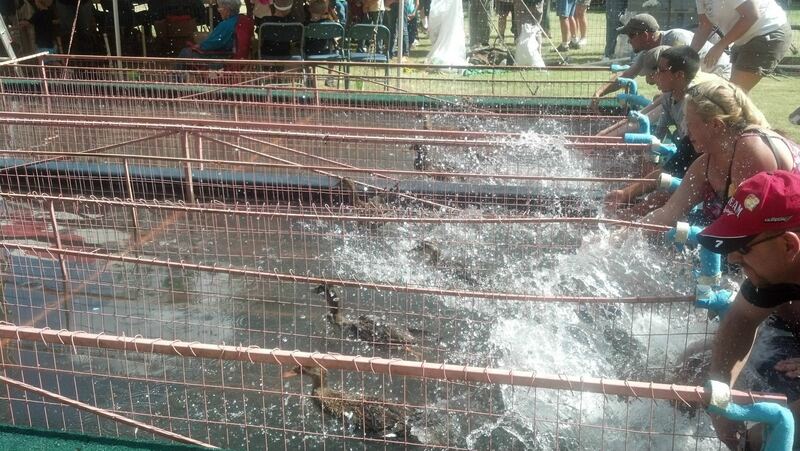 This weekend is the annual Deming Duck Races and it is something in which my family has participated for many, many years. I have missed a bunch of them due to travels and obligations, but I attended when possible. This was also Matt’s first experience with duck races, so it was a chance for local living, fair-like fare, and family time. We made a few memories too. What is a duck race? It is exactly what it sounds like. This is the wet track. The dry track is exactly the same, but without water. Go figure. Along with being required to race a duck, we also rode many rides with the children. The jumbo slide was a blast and we even got my mother to take my niece. I rode the slide with Ethan twice, and I took him on the ferris wheel. The video of my mom coming down the jumbo slide is glorious and will likely be loaded onto my Youtube channel once I get back to Albuquerque. My sunburned face was epic as well. The other reason for opting to come to El Paso again this weekend was Ethan. He is starting preschool on Monday and my mom wanted to be here for his big day. Ethan goes through phases of excitement, apathy, and dread, but he is almost five. It is to be expected. So mom was here for his orientation on Friday and will be here to watch him walk into his class for the first time on Monday. Okay, Army stuff. In my last post, I talked about finally having a board date and continuing to work towards OCS and active duty. The board itself was on Wednesday and there were no other candidates but me. There was supposed to be another, although he was striving to be a warrant officer and was not any form of competition for me. This is good, I remember telling the recruiter, because competition tends to bring out the jerk in me. I got to the Reserve Center – where the board was being held – early enough to sit around on my thumbs for about an hour. My goal was to show my I-Love-Me binders to some of the reserve soldiers there, but it did not take nearly as long as I imagined it would. So I wandered, and worried – naturally – that I was going to screw things up for myself. I worried for nothing, of course, but I am pleased that I was so nervous. It kept me on my toes and the board itself was just as difficult as I imagined it would be. Where Soldier of the Month, Soldier of the Quarter, and promotion boards require studying and technical knowledge displayed by quoting field manuals and Army regulations, this board was about leadership, my personal experiences, and scenario critical thinking. My dad arrived just before I was called into the board. He and one of my recruiters chatted while I was sitting on the hot seat, sweating in my nice, blue shirt. If I took only one lesson away from this experience – and I assure you there was more than one – it was only to wear the blue dress shirt in a situation where I am comfortable and not likely to sweat. Thankfully I never raised my arms, so the board members were spared, but I knew. After the question and answer session, I was sent out of the room for them to discuss my fate and my whole life was like the air rushing out of a balloon when I heard that I was going to be recommended as a candidate for OCS. That is the end, right? Wrong. Unfortunately, my success on Wednesday is not the ultimate and final say in my future. My application, I-Love-Me binders, and the board members’ notes will be sent to USAREC. In the beginning of October, they will deliberate over all the applications they have received and they will choose who gets to go and who must either try harder, wait longer, or make alternate plans. The good news is that my recruiting station received word that the mission for prior service applicants has been increased to 600. Now, I do not know what it was previously, but the hoops through which I had to jump tells me that it was MUCH lower than that. So I have taken a step in the right direction and have received at least one bit of good news. Now I settle in for more waiting. I am good at waiting. September is going to be a long, but great month. Most of it will involve waiting, but some of the time spent waiting will be in California. We are finally going to take care of Matt’s name change on his license, some dental work for both of us, and – most importantly – spend some time with his mom and dad. I wish the month-long visit had worked out, but there was always one thing interfering in the plans. I am still stoked that we get to go at all with the unknowns the Army has thrown my way. That will do it for tonight, I think. I have broken a thousand words and could likely keep going if I don’t rein it in now. Happy reading, ladies and gentlemen.